Panopto has introduced a number of updates to its enterprise video platform, including a quizzing tool that allows users to create multiple choice, checkbox and true/false quizzes within instructional videos. The quiz maker "enables instructors to test comprehension, reinforce key concepts, and improve knowledge retention," according to the company. Students can review grades, retake quizzes and access information about correct answers, while faculty can receive instant feedback on learner comprehension and challenging course content. Real-time reports provide instructors with insight into student performance. Quizzes can be added at any point in a video, and instructors can add as many quizzes as desired to each video. "Interactive video helps people retain information by applying concepts that they've just learned," said Eric Burns, co-founder and CEO of Panopto, in a statement. "With the introduction of video quizzing, students and employees can absorb new material at their own pace, and then transfer that knowledge to new contexts." 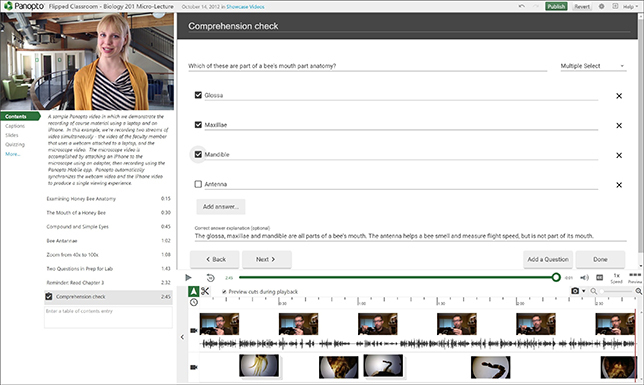 Improvements to video captioning, including the ability to correct machine-generated captions in the video editor and select custom color, position and size options for caption text. For more information, visit the Panopto site.